There were a couple of interesting signed books for sale on eBay last week that gets to the heart of what makes a particular book collectible. A 1963 John Calder Dead Fingers Talk sold for about $160 (ebay, PDF) and a Grove Ticket That Exploded sold for $202 (ebay, PDF). Both books attracted double digit bids. My gut reaction was that I was very surprised by these prices. Dead Fingers Talk is definitely the rarer book especially signed. In 2001, this exact copy of Dead Fingers Talk sold at auction in California for $316. From rare book dealers, signed copies can run $300-$450. A few years ago one could find a signed Grove Ticket That Exploded for $150-200 with $250 being top dollar. That has changed recently as signed Groves are now up to $400 and more on abebooks. What can explain the decline of the Dead Fingers Talk at this eBay auction? The high price on the Grove and the low price on the Dead Fingers Talk on eBay may relate back to the signatures on each book. The Grove has what looks to be a tight, contemporary signature possibly from the late 1960’s although it is undated. The Dead Fingers Talk has a very loose, late signature dated from March 1997. Early Burroughs signatures are more highly prized than the looser, late signature. As Burroughs got older and more famous, he signed much more often, thus making the later signatures more common and less desirable. It was not uncommon for book collectors and dealers to make the pilgrimage to Lawrence in the 1990’s with arms full of rare or not so rare edition for Burroughs to sign. For example, the signatures of the Nelson Lyon collection that sold in 1999 (widely considered one of the major Burroughs auctions of the last 20 years) was full of late signatures. The appeal of the Lyon collection was that any of these incredibly rare magazines were signed at all. Apparently given the numbers of late signatures out there, Burroughs willingly signed in his later years. For me, the later signatures are not as visually pleasing as well as more common. As Burroughs got older, he began dating his signatures; many of the signatures from the 1960’s and 1970’s are undated. I have never seen a signature from the 1950’s although I have heard of signed copies of the “Letter from a Master Addict” offprint from 1957 being for sale. I own a signed copy of the 1960 Minutes to Go that was in all probability signed at a book signing party in 1960. That signature is very different from the later signatures that I own. In my opinion, the Grove Ticket did very well on eBay due to the quality of the signature. The Dead Fingers Talk underperformed due to the shaky, late signature. I would expect the values to change dramatically if the signatures were switched. The Dead Fingers Talk is the more desirable book. 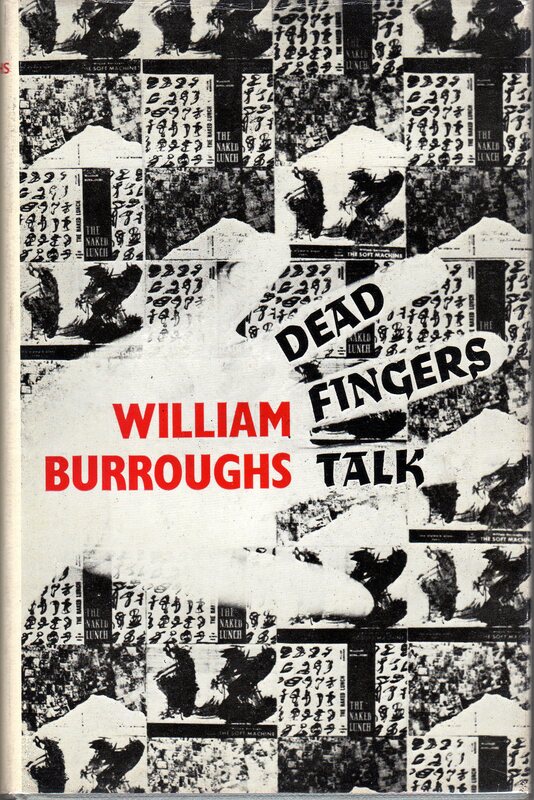 Dead Fingers Talk is the coolest first edition hardcover available to the Burroughs collector. In a publishing history dominated by incredible paperback editions like the Olympia Press titles, the Ace and Digit Junkies, Time, Minutes to Go, APO-33 and The Exterminator, Burroughs’ Dead Fingers Talk holds its own on a visual level. This may be because the Dead Fingers Talk dust jacket refers back to all the great Olympia Press dust jackets. The title of the book refers to the line “Only dead fingers talk in Braille” from Naked Lunch. The imprint of the mangled hand over the front cover also adds to the dust jacket’s appeal. The cover slyly references Burroughs’ Van Gogh act of his youth, when he cut off his finger to impress a crush. 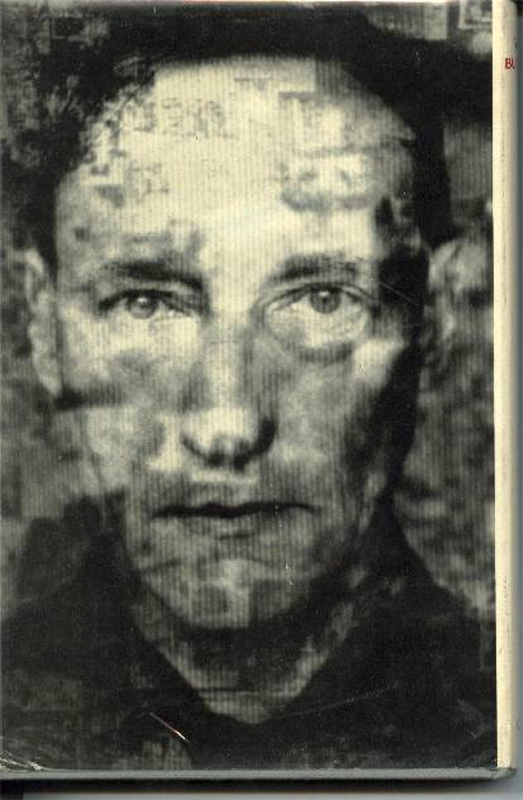 The icing on the cake is the fantastic photo of Burroughs on the back of the dust jacket where he looks particularly spectral and menacing: a fitting mug shot for a literary outlaw. Besides looking good, Dead Fingers Talk is pretty hard to find. Many people do not even know the book existed. The book was published in late 1963 in an edition of 4,000 copies. Although the book was issued in paperback throughout the 1960s and early 1970s, it has been out of print for quite awhile, so not many people have actually read it. That includes me. Horrible to say, but my hardcover copy is too nice to actually read. This is one of the downfalls of being an obsessive book collector. It is difficult to fully enjoy all one’s books. Over the years, I have never happened upon a readable paperback copy. I would be interested in hearing from anybody about what Dead Fingers Talk is like. I have heard differing opinions. Some describe it as a mere cut and paste of the Olympia titles and other proclaim it a totally different novel altogether. In any case, the Naked Lunch material appeared in a different order than the Olympia Press edition thus adding to the legend that Naked Lunch was collated on the fly by Burroughs, Gysin and Sinclair Beiles. Dead Fingers Talk is interesting on a historical level as well. (See wikipedia on Dead Fingers Talk. John Calder, the avant garde British publisher, issued Dead Fingers Talk as a Burroughs reader to prepare and introduce the British public to the shocking nature of Naked Lunch which had yet to be published in Great Britain. The book capitalized on the recent international fame of Burroughs generated by the 1962 International Writers Conference held in Edinburgh. The book contains pieces of all the Olympia Press titles: Naked Lunch, The Soft Machine and The Ticket That Exploded, as well as new material. Needless to say, Dead Fingers Talk created a stir. For an astounding 13 weeks, letters both praising and damning the novel appeared in the Times Literary Supplement. John Willett got the ball rolling with a negative review of Burroughs’ work simply titled “Ugh!” Edith Sitwell, Michael Moorcock, Victor Gollancz, Anthony Burgess, and Eric Mottram all got into the act on both sides of the argument. The book generated just the right kind of controversy, i.e. not the legal kind associated with obscenity or censorship, for John Calder to issue Naked Lunch in 1964. By 1964, Naked Lunch swept the Western world and began to redefine the boundaries of literary art. In 1982, Calder reissued Naked Lunch with all 56 pages of the Ugh Correspondence. The Grove Press edition of The Ticket That Exploded does not have the same historical importance or aesthetic appeal. In addition, this edition was issued in a run of 10,000 copies making it far more common. I do not want to downplay the Grove Ticket That Exploded too much. It is heavily revised from the Olympia Press edition and includes the major statement “The Invisible Generation” taken from Burroughs’ contributions to the British underground newspaper The International Times. Clearly, the Grove Ticket is a monumental text in its own right, but as a collector I would much prefer to have a signed Dead Fingers Talk in my library. That said, I would, like many eBay buyers, shy away from a late Burroughs signature. The mystery remains why a desirable collectible like Dead Fingers Talk would fail to hold its value a mere five years after a documented sale. One would tend to worry about the Burroughs market if it was not for the strong showing by the Grove Ticket That Exploded. Possibly the lesson to be learned here is that just having a signed book is not enough. It also matters when that book was signed. Written by Jed Birmingham and published by RealityStudio on 5 April 2006. I’m new to the reality studio and this article caught my eye. I used to collect Burroughs avidly but over the last few years I seemed to have lost interest. I have a decent collection though, which includes a first edition of Dead Fingers Talk, published by John Calder 1963. Its not signed, but it still has the original plastic wrap over the dust jacket and is almost mint. I got it in London in 1998 and I think I paid about Â£30 for it. The image shown in your article is NOT the original front, which is actually black and white and not sepia brown. Ian Sommerville designed it and its easily the best jacket from the period. DFT is actually described by Calder on the jacket as a novel – ie it is comprised of edited excerpts from NL and the Nova Trilogy, assembled according to a linear (in a thematic sense) progression. It opens with ‘I can feel the heat closing in’. In a curious way it is the definitive edited version of Burroughs early output, and I suspect that the condition of the copy that sold in ebay may not have been that great…? many years ago, i happened upon a copy of DFT in a second- hand junk shop in Vancouver’s Downtown East- side neighbourhood ( old hotels and bars, vintage neon, abandoned storefronts, alcoholics, crack- addicts, etc…) – the edition i found was an extremely garish, cheap paperback edition ( dell maybe ? ) for which i paid something like 25 cents. never read it. retained it for novelty’s sake. truthis- i have never been able to complete a reading of a Burroughs ‘ novel ‘. anyway, my cheap edition eventually went out my front door in a cardboard box- along with hundreds of other titles- bound for, what else ? – second- hand stores ! naturally, i now regret parting with it- and wish i had kept it. i truly wonder where that little, cheap, garish edition now is !!! You are going to pay about $200 or so for the 1960 version. Email me privately if you need more information. I have DFT paperback Tandem Edition 1966 with a great cover – picture of junky shooting up, needle in arm, blood flowing. “The sensational novel of the nightmare world of the junky by the author of The Naked Lunch.” 224 pages. I have DFT 1963 hardback with a damaged dust jacket, signed, and dedicated to my dad, around 1965, also a paperback Junkie also sidned and dedicated, probably at the same time in London at a restraunt Burroughs frequented in chelsea. I have a copy of Dead Fingers Talk it is a 1963 first edition hardback with the dust jacket intact . It is an ex library book and shows that it has been taken out almost constantly since 1972 (earlier tickets not in book) until nov 93 when it was sold off – the ticket is at the rear of the book. Despite this it is in amazing condition – all readers must have been very reverent with the book! I think it gives a feel of the importance of the text that it was constantly read. However , I am looking to sell it and I wondered what it’s value might be? Re book as text, not as object, DFT is, incredibly, available for the Kindle, and it’s under $8 to boot. Has anybody ever identified the “extra material” in DEAD FINGERS TALK? At the time I compared it with the three Olympia Press books I had by Burroughs and could find not a single sentence that didn’t come from them. I have to wonder if the claim was just more of John Calder’s sharp practice. I went to a Burroughs signing in 1980 with a library copy of DFT. He was not impressed! Bill did, however sign it! (No date) the next x mas I went to meet a friend with the book wrapped up as a Christmas present. When we met on the street he punched me in the eye over a girl, I dropped the book and ran neither of us picked it up. It breaks my heart to think that there were only 4000 copies of it!